The Ford Taurus X is a four-door crossover that seats up to seven passengers. The Ford Taurus X is manufactured in Chicago, Ill. alongside the Ford Taurus, Mercury Sable and Lincoln MKS. The Ford Taurus is a brand which has long been associated with mid-size family sedans. However, for 2008, needing to replace the aging Freestyle crossover, Ford decided to take a page out of the Chevrolet Lumina’s book and created the Ford Taurus X. The X is tangentially related to the Taurus sedan in that both of them use the same underpinning platform. However, the similarities end there - the Taurus X is a full-fledged, seven passenger crossover vehicle. Despite being pegged as a Freestyle replacement, the Taurus X at first glance appears to have more in common with the large Ford station wagons of yesteryear than the somewhat confused styling of the minivan / crossover that preceded it. The vehicle’s sleek, almost Saab-like profile shares less with its crossover sibling the Ford Edge than it does with the car-like Fusion, with a little bit of the Explorer thrown in for good measure. The European flavor is less surprising when it is revealed that the Volvo XC90 shares many components with the Taurus X. Like most Ford crossovers, the Taurus X is powered by the ubiquitous 3.5 liter Duratec V6 engine in 263 horsepower trim. Power goes to either the front or all four wheels via a 6-speed automatic transmission. Fuel economy is 15 miles per gallon in the city and 22 on the highway for the all-wheel drive version of the X, which is reasonable for a vehicle of this size. Front-wheel drive editions see slightly better numbers. In terms of trim levels, the Taurus X begins with the slightly upscale SEL before moving to the Eddie Bauer edition which bridges the gap between the entry-level vehicle and the range-topping Limited. The SEL is fairly basic, with cloth seats and 17 inch wheels, while Eddie Bauer continues their long association with Ford by outfitting the Taurus X with leather, interior wood accents and special paint for the outside. 18-inch wheels complete the package. The Limited increases interior comfort with heated front seats and a nicer stereo, and a wide variety of options packages are available for all versions of the Taurus X. Given its size, it is no surprise that the inside of the X feels spacious. With both rear rows of seating folded down 86 cubic feet of cargo can be transported, and a power lift gate makes it easier to accomplish loading when hands are full. The suspension and acceleration are representative of what a large people mover should be – smooth, comfortable, and responsive enough so that passing and hill climbs are accomplished with a minimum of drama. The Taurus X is not a performance vehicle, but it never seems underpowered or on the edge. Perhaps the biggest question surrounding the Taurus X is whether it will be able to find a place in Ford’s already crammed crossover and SUV lineup. With vehicles like the Edge and the new Flex making waves of their own, it is possible that the Taurus X will be left in the dust. Regardless, it does make an excellent option for basic family transportation, especially if any of those trips involve the need to carry camping supplies, skis or snowboards. 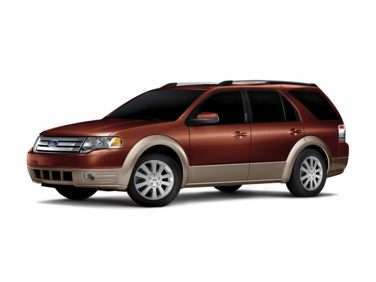 The 2009 Ford Taurus X is a carryover from 2008. The 2009 Taurus X is sold in three trims: SEL, Eddie Bauer and luxury-oriented Limited. All three versions of the crossover use a 263 horsepower, 3.5 liter V6 engine that also produces 249 lb-ft of torque. A 6-speed automatic transmission handle gearshifts, and all-wheel drive is an option for each trim level. Front-wheel drive versions of the Taurus X turn in fuel economy of 17 miles per gallon in city driving and 24 miles per gallon on the highway, while all-wheel drive editions are rated at 15 miles per gallon in the city and 22 miles per gallon on the highway.